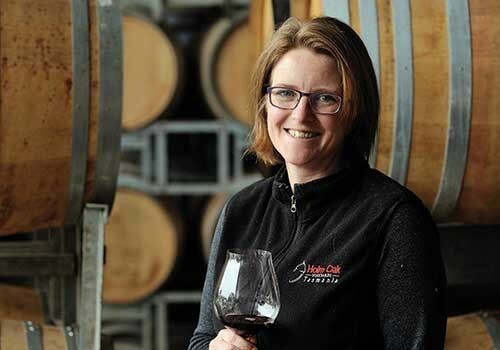 The vineyards that winemaker Rebecca and her viticulturist husband Tim Duffy own in the Tamar Valley are steeped with a rich Australian history. The original and iconic use of their site was to grow Holm Oak trees to be used in making Alexander Patent Racquet Co. tennis racquets in the 1930’s. Sadly, the wood from the Holm Oak trees didn’t meet the standards to be turned into racquets but that’s where this story takes a fortuitous turn for the Tasmanian wine industry. Grape vines were planted in this rich and fertile land in 1983, making Holm Oak one of the older vineyards in Tasmania.